TANINAH.....INCLUDES MEALS, featured on TV, $130 - $180 p/p, per night, 35 max. Taninah is a fully staffed exotic jungle retreat offering 7 charming guesthouse villas (able to accommodate up to 35 guests). OUR RATES DEPEND ON SPECIFIC RESERVATION DATES AND NUMBER OF GUESTS IN YOUR PARTY. Rates are based on a minimum specified number of guests according to Taninah Rate Sheet. This is often not reflected on the VRBO booking site, please go to taninah.com or contact the owner for the accurate rates. Price per guest is lower once you have passed the minimum number of guests applicable to your specific reservation dates. Group minimums vary between 10, 15 and 20 guests, depending upon whether you choose holiday or non-holiday dates. Another factor is the pricing for children, which VRBO quotes cannot accommodate. We do not charge for children under age 6 at the time of travel, so DO NOT include in your party's guest count when seeking a VRBO quote. DO include on the guest form sent to the owner, a list of all children six and under, showing their age at the time of travel. Menus and sleeping accommodations are based upon this information. Generally our rates range between $130 and $180 USD per person/per night INCLUDING breakfast, a mid-day snack, and dinner, a starter beverage package, taxes, and services of full staff. Taninah is offered in its entirety to ONE GROUP AT A TIME, OUR GUESTHOUSES ARE NEVER RENTED INDIVIDUALLY. Set on 10 Garden-of-Eden-like private, fenced and gated acres, Taninah offers a unique experience featuring incomparable amenities in an unrivaled setting for the area, featured extensively on TV and in magazines since 2004. Taninah is ideally suited for family reunions, multiple couples traveling with or without kids, multi-generational families, weddings and/or travelers looking for an exotic experience. Five of the Taninah's 10 fenced and gated acres have been carefully sculpted and thoughtfully developed. Terraced gardens, extensive lawns, tropical trees, and enchanting water features grace the landscape and frame our guest houses in an incomparable paradise-like setting. Friendly, helpful, and attentive on-site Mayan staff of 10, provide an authentic cultural experience. Our staff members are on site 24/7, they prepare and serve a fresh, Mayan daily meal (breakfast, a mid-day snack, and dinner), provide daily housekeeping service and are always available to assist with any need that might arise during your Taninah experience. Off-site property manager offers daily support & assistance including concierge services (also available 24/7). Taninah is located in the heart of the Riviera Maya. The property is located 75 minutes south of Cancun, 25 minutes south of Playa del Carmen, and just 10 minutes away from one of the most spectacular beaches in the Mexican Caribbean called Xpu Ha. Taninah is also within 15 minutes of fishing, diving, snorkeling, dining, shopping, spectacular cenotes, a swim with dolphins, medical services, internet services, tennis, golf, and much more. Our installations and amenities are unparalleled starting with a spectacular private cenote (grotto) complete with a 30’ underground water slide which finishes with a cool and refreshing splash into a natural crystal clear pool of fresh water; a swimming pool and Jacuzzi; game room offering pool table, ping pong, air hockey, gaming table, balls, bats, Frisbees and more; padded playroom for toddlers & kids of all ages filled with Gymboree equipment; a weight/fitness/yoga room; a library; a basketball half-court; an in-ground trampoline; tree house; sand box; zip line; swings; a duck pond, and much, much more. Taninah is ideal for children of all ages as there are endless activities and possibilities. In turn, parents will be able to relax and enjoy their vacation without worrying about keeping their kids occupied. Taninah has been featured on Home and Garden Television (HGTV's) Extreme Homes. Caribbean World, a quarterly magazine, featured Taninah in an article titled "Living in Eden" where our cover billing was, "Dream Home in Mexico". In early 2006, The Travel Channel filmed Taninah for "Amazing Vacation Homes". Travel + Leisure, Family Edition featured Taninah in a two-page spread in the Spring 2008 issue. TIME magazine featured a picture of Taninah in an article about vacation rental homes. In 2014 a Discovery Channel episode of "Dude Your Screwed" was filmed at Taninah. In 2015 an episode of The Travel Channel's upcoming "Life's a Beach" was shot at Taninah. Taninah is the only vacation property in the Riviera Maya to be so honored and recognized. Our location provides an ideal combination of private, peaceful, remoteness as well as easy access to all the exciting attractions the Riviera Maya has to offer. 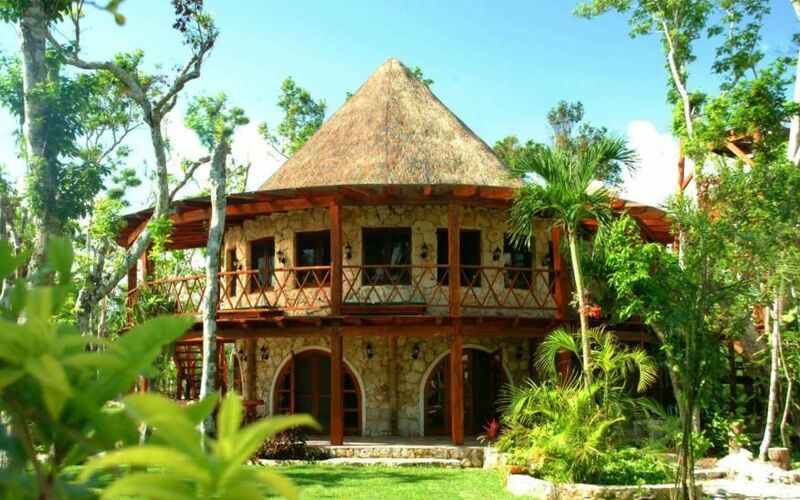 Undoubtedly, Taninah is the most unique vacation experience and exotic rental property in the Riviera Maya. For more information, visit our web site and read all the stellar reviews, including ones from children who actually abandoned their cell phones while having fun at Taninah. My name is Marino in 1998 I began building in what I envisioned would become a family getaway set in the midst of a nearby pristine jungle. In 1999, I completed the first incarnation of Taninah. Over the course of four glorious years my family and I enjoyed Taninah as our private and secret retreat. During this time I continually added elements transforming Taninah into my version of paradise. In 2003, I decided to turn Taninah into the most unique vacation experience and exotic rental property in the Riviera Maya. Taninah is truly incomparable, a singularly exceptional vacation experience you and your entire family will never forget. toilet, shower, Double shower heads, double sinks. Spectacular beach within 3 miles of Taninah that is family-friendly. Taninah is within 3 miles of Caribbean waters; fishing, diving, snorkeling. 10 Acre private, gated jungle resort Taninah, rented to one party at a time offering 7 guesthouses, fully staffed, including fresh gourmet meals cooked by Mayan chefs. Pool and cenote (grotto). Staff have radio phone available to guests for emergencies only. Notify your provider about travel plans to Mexico. Service availability and quality will depend on provider and specific mobile device. It would be a shame for anyone to miss-out on an unforgettable Taninah experience due to one or more misconceptions about our property. For this reason, we implore you to read scanned images of our previous guests hand-written reviews at taninah dot com. We have built our guest houses in a way that maximizes comfort by using cross ventilation, we've built our structures under tall trees (maximizing shade potential), and we've used proper building materials and techniques to ensure a cool environment. In addition, our guest houses are furnished with floor and/or ceiling fans. All of these make it not uncommon to have guests turn fans off (even in the summer) due to how cool our guest houses can get at night. We completely understand why people's perception would be that it might be too hot or too uncomfortable; however, we believe it would be a shame to skip the opportunity of a Taninah experience based on this misconception. We provide all linens including beach towels. We are more than happy to take guest laundry to a local Laundromat for washing and return to Taninah when ready (usually 24 hours). Please ask us for details. Only suitable for basic access and email. Ample outdoor, open-air living and lounge area located poolside. Available for DVD watching only. Many courses located within 30 minute drive. Property has a truly spectacular cenote (grotto) complete with a 30ft, underground water slide, swimming pool, eight-person Jacuzzi, gym/exercise/yoga room, game room with pool table, board games, dart board, lawn games & more, basketball half-court, lawn volleyball court, 9-hole miniature golf course, in-ground trampoline, large padded playroom for toddlers & children filled with Gymboree equipment, tree house, sand box, zip line, duck pond, walking trails, horseshoe court, 24/7 onsite staff & much, much more. Additional amenities include fenced & gated property, onsite 24/7 staff, covered garage, bonfire pit, multiple hammocks, ceiling fans, all linens, Iron & Board, 3 TVs & 3 VCR/DVD players, 300+ DVD movie titles, toys and games for kids & adults, external sound system for iPod, telescope, binoculars and more. The Taninah Resort was excellent from the professional and friendly staff to the well-kept and clean sleeping quarters. It is an excellent place to have a family reunion as we had 25 people and the resort staff handled everything well and kids were entertained with activities and various facilities. We had a couple of kid's birthdays, the staff bought and setup a piñata which many people said it was one of the highlights of the visit. A thank you to Victor for all his work. Also I would like to thank Pancho for all of his help. Everyone in the group said the experience was wonderful. We all highly recommend Ed F.
I'm so glad your entire family enjoyed their Taninah Experience. My staff thiughroughly enjoyed hosting you and truly appreciate your generosity. I hope in the not too distant future your family will return to Taninah. We could not have been happier than choosing Taninah as our place to get friends and family together for my 50th Birthday celebration! The staff was courteous, respectful, and fun all at the same time. The food was excellent and I have requested recipes so that we can relive our vacation back home! Everyone had tons of space and the quiet, relaxed atmosphere was wonderful. The staff went out of their way to accommodate our sometimes weird requests. The cenote was a special treat and looking at the stars with the telescope was fantastic! It was a pleasure and an honor to have you celebrate such an important milestone with as at Taninah. I'm so glad you all enjoyed your experience. My staff had nothing but praise for your kindness and appreciation which, quite frankly, means the world to me and speaks volumes of you and your party. My staff and I thank you and look forward to the opportunity to host you again in the not too distant future. The property was truly a paradise with exotic birds, interesting wildlife and well-maintained grounds. There were so many activities for the children to do in peaceful surroundings that we often chose to stay here rather than visit other parks. After a few hours at the beach the kids were saying "Can we go back to Taninah?"! Staff were so friendly and accommodating. They went out of their way to meet our needs. The meals were mucho delicioso and gave us a chance to experience local cuisine. The pool was kept in pristine clean condition. The owner, Marino, arranged for staff to help us plant a couple of hibiscus in memory of our loved family members who had passed away. We recently returned from Taninah where my wife and I spent a week with our five adult children, their spouses and 13 grandchildren (25 in all). The common areas felt plenty spacious and it was so nice for each family to be able to retire to their own accommodations at the end of each wonderful evening spent at Taninah. The padded play room, cenote, zip line and miniature golf course all saw plenty of use and made the parents' (and grandparents') jobs so much easier! We did venture out one day to the beach and another on a fishing expedition, but the best times of our vacation were times spent at Taninah. The cool water of the cenote was particularly pleasant. Karl was eager to help with anything we needed and the Mayan staff was nothing short of incredible. It seemed that they would appear out of nowhere any time you needed or wanted anything and would make it happen. The meals were wonderful according to vegetarians and carnivores alike. Nothing gives me more pleasure than to hear that you and your extended family enjoyed Taninah as much as you did. Thank you for being wonderful guests, my staff enjoyed hosting you immensely and we all hope you will indeed return in the not too distant future. We stayed at Taninah for 7 days with 6 adults and 6 kids (ages 1 to 7). Everyone had a fabulous time! We went on one excursion to the Tulum ruins, another cenote and the beach, but otherwise we enjoyed all that Taninah has to offer (play structure, play room, zip line, trampoline, basketball court, game room, mini golf, pool, hot tub). And ... everyone's favorite, our very own private cenote with a water slide!! Adults and kids used the cenote almost every day. The staff at Taninah is so friendly and helpful and prepared amazing breakfast, lunch, afternoon snacks and dinner!! Yum! If you are thinking about booking at Taninah... do it! Beaches & Beachcombing, Reefs, Mayan Ruins including Tulum, Coba, Chichen Itza, Mayan Village of Pac Chen, Ecological Theme Parks such as Xcaret, Xplore & Xel Ha, Ecological Biosphere, Sian Ka'an, Scuba Diving, Cenote Diving, ATV Jungle Tours, Yachting, Deep Sea Fishing, Marina, Fly Fishing, Swim with the Dolphins, Hidden Worlds - Cenotes, Golfing, Restaurant Dining, Birdwatching & much more. All reservation payments are non refundable. Please be sure to read our rental contract document entitled "SECURITY DEPOSIT and RESERVATION PAYMENT INSTRUCTIONS". We highly recommend purchasing trip insurance. Please inquire about less than minimum-required guests or nights. Property is only rented to one group at a time and guest houses are not rented out individually. IN COMPARING PROPERTIES, IT IS IMPORTANT TO UNDERSTAND THAT TANINAH INCLUDES DAILY FULL BREAKFAST, A MID-DAY SNACK AND 3-COURSE DINNERS PREPARED BY MAYAN CHEFS USING FRESH LOCAL PRODUCTS. Unlike the hotels that offer meals included in price, you are not stressing over meal times, rushing to get a table or standing in long buffet lines. Please ask for our comprehensive and highly informative article on Hotel vs. Taninah stay, which will surely introduce topics most travelers to this region have not contemplated. The owner is a resident of California and has been in the hospitality business of this region for 37 years of his life and comes from generations of resort/hotel ownership. He is readily accessible prior, during and after your trip.